Restaurant operations just got a whole lot easier with the use of touch screen, point of sale systems (POS) such as TouchKitchen. In a busy kitchen it’s imperative that orders are clear, organised and legible in order to reduce mistakes. 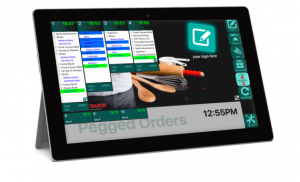 As soon as the wait staff place an order through their TouchPocket it appears instantly on the TouchKitchen screens. Not only does this eliminate mistakes or loss of order slips, this also speeds up the whole process, in turn resulting in a higher volume of orders. There’s many beneficial qualities for the TouchKitchen system such as the ability to shelve orders between courses and clear them when the entire meal is completed. Urgent orders can be received with favourable timers in order to get them through quickly. 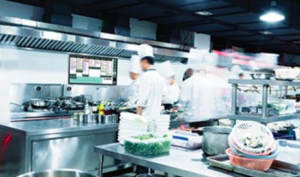 This system can be linked with digital signage which allows the kitchen to alert customers that their order is ready or alternatively print a ticket to signal waiting staff for service. All of these benefits merge together to form a seamless procedure throughout the whole restaurant, ultimately resulting in a higher turnover of customers for restaurant owners, provide staff with a less stressful work environment and give customers top quality service. One of the main ways in which the industry is changing due to POS is through increased levels of service. The streamlined process you get as a result of using POS systems such as TouchKitchen, allows time to create a restaurant experience built on quality service. Through keeping employees on the restaurant floor as oppose to running back and forth to the bar and kitchen, they’re able to address any problems customers may have immediately. Another direct benefit restaurants are seeing through the use of POS systems has been a decrease in wage costs. Again, back to that streamlined process, restaurant managers are seeing that the impact of eliminating the back and forth trips and the need to leave the restaurant floor has freed up a lot of time for staff ultimately resulting in reduced staffing. If you’re interested to find out more or feel you will benefit from a POS system in your establishment please fill out the form below.